Am I the only only crocheter who doesn’t think crochet is relaxing? frustrating and possibly soothing (does NOT mean the same thing) but never relaxing. What’s so relaxing about obsessively working on a piece until my hands and wrists hurt? What’s so relaxing about looking at your piece and knowing you’re so far from being finished (I’m looking at you dragon cloak)? What’s so relaxing about planning and organizing and trying to learn new things and not always being successful? What’s so relaxing about obsessing over trying to finish a piece you can’t possibly finish in one sitting? What’s so relaxing about being pumped and excited to start a new project? Is it relaxing when I have to complete a gazillion pieces for the craft fair? And so many more things that aren’t that relaxing. I don’t have time to relax! I’m crocheting! Not to0 long ago, my sis-in-law and friend was gazing out to my patio through the sliding glass door. She cocked her head and exhaled, “Huh, I never noticed that all your plants were the same.” I giggled sheepishly because they were indeed all the same. I blurted out, they’re the only plants I can’t kill!” She laughed with understanding. She said they looked nice. I wasn’t sure if I should believe her. Many years ago, someone, I can’t remember who because it was so long ago, commented that she (I’m pretty sure it was a she) hated this plant we saw in someone’s garden. It’s a succulent that has these big, shiny, tear drop shaped leaves. She said she hated them because they were the weeds of the succulents world. I didn’t say anything because I had some of those in my own garden. I was embarrassed to admit that I actually liked them. I didn’t know they were equivalent to weeds! I have a black thumb when it comes to plants. I can pretty much kill anything except weeds. That hasn’t stopped me from trying to have a pretty garden , albeit with various degrees of success. I finally had to come to the conclusion that gardening just isn’t my thang. I know I can learn if I really wanted to but I just had to admit that I obviously didn’t want to. I decided I wasn’t going to be embarrassed for liking the weeds of the succulent world! How silly of me to let one person’s opinion color how I felt about certain plants. I chose to embrace that plant and used it all around my house! I couldn’t kill it no matter how much I neglected it. In fact, I could just cut off a stem, a leaf, or any part of it, stick it in some dirt, and voila! It grew. I loved it. It didn’t care if it only got watered when it rained. I even started wondering if I could do topiary with it. If I messed up, no harm no foul. I felt loved back by this plant because it refused to give up and die no matter what I did to it. Today, I saw a bunch of broken stems and leaves on the ground outside because we had some strong winds. I grabbed them, found a cute pot that’s been rolling around outside and put some dirt in it, some pretty rocks and those broken bits plus I cut some more and shoved them right in. I put it on my kitchen counter by a large window. The plant that will not die! 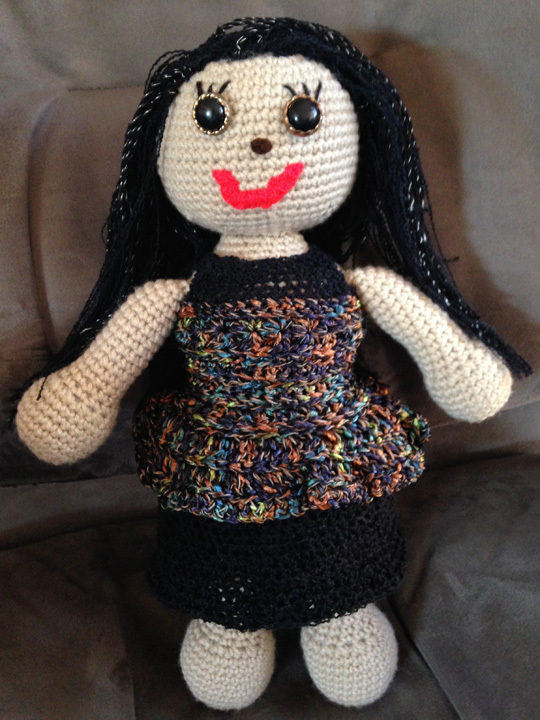 Mini Me is finally complete and she was so much fun to make. And apparently she was fun to play with. 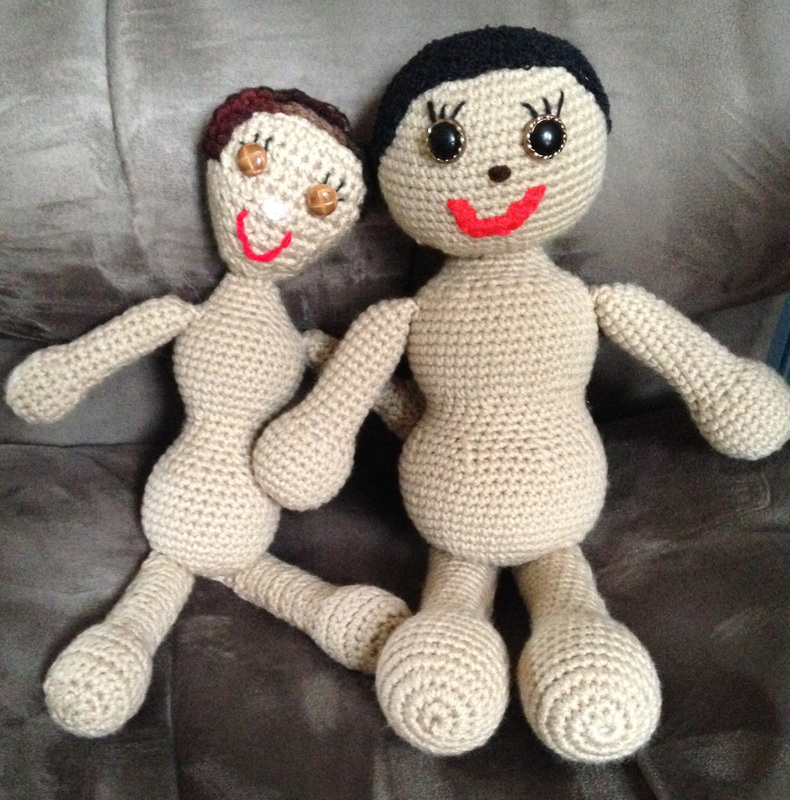 It’s always a good sign when people want to play with or cuddle the dolls I make. I was visiting my sister while working on Mini Me. Her hair was finished and I was going to make her outfit. As usual, I told my sister that I brought my crochet stuff in case she bored me and I needed something to do (this is tongue-in-cheek, she never bores me 🙂 )Before her outfit was complete, my sister grabbed the doll and kept making cutsie faces at it (she would never admit this of course and would probably call me a liar). Then, she started braiding her hair. My sister couldn’t help self. She just had to braid her hair. Worst of all, she kept giving me advice on her outfit. It should be this color not that color. The skirt should go like this and not like that. You get the idea. Since I consider myself a smart person, I listened. It’s a good thing I did because the outfit was a big hit. Mini Me’s Surprise Sister So, while I was working on finishing Mini Me, who was planned, thought out, and carefully created, her little sister accidentally sprang into creation right alongside her. 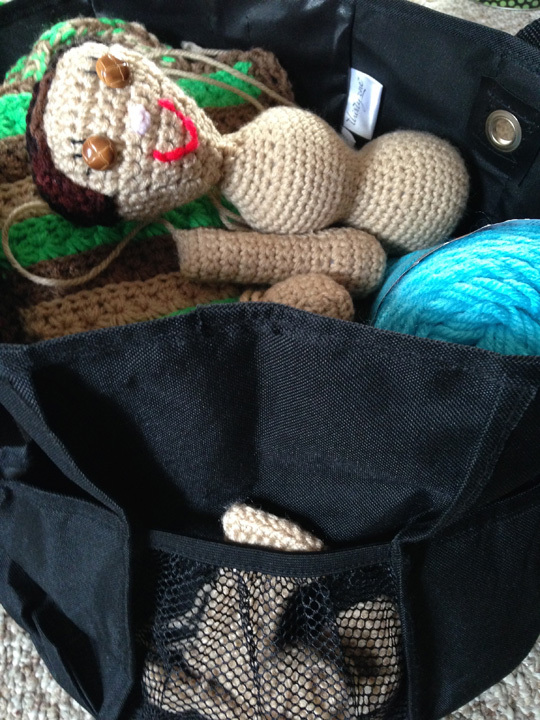 My project bag was littered with loose body parts (doll parts!). These parts have been hanging around for quite some time just waiting to be joined to some finished project. There was a head that turned out smaller than I wanted so I threw it in the bag. There were some arms and legs that I made for illustrative purposes for my book. I threw them in the bag too. I eventually decided to make a body for the head and got about halfway through it and started something else so that was rattling around in the bag too. Doll arm waving “hello”…why would anyone find this creepy!? 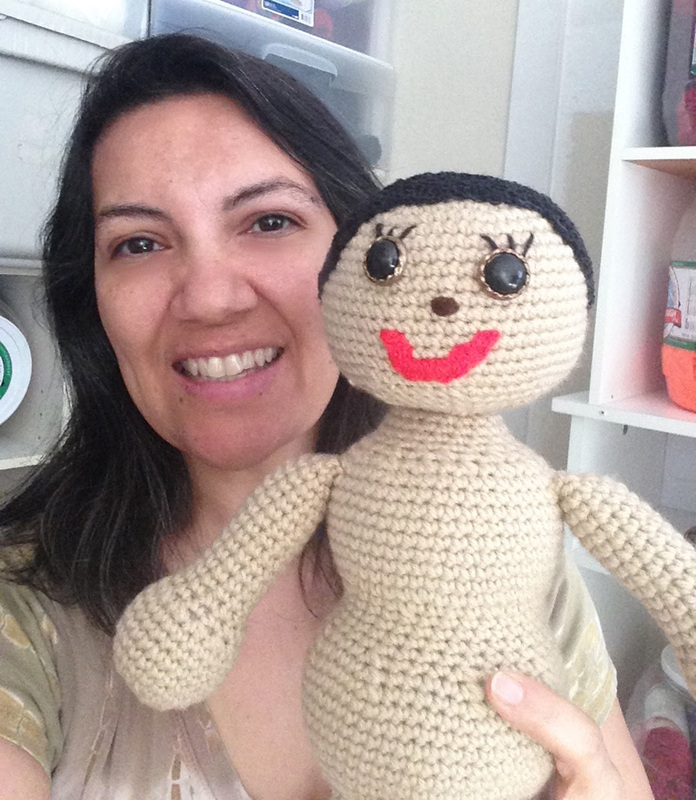 When I started working on Mini Me, I needed to use that skein of yarn that had that unfinished body attached to it. No problem, I thought. I could just use the other end of the skein to work on Mini Me. I’ve done this many times in the past so I pushed that half body to the side and created Mini Me. The more I pushed that half body to the side, the more it nagged me that it wasn’t finished. I blissfully ignored it when it was just hanging around in my bag but it could be ignored no more. 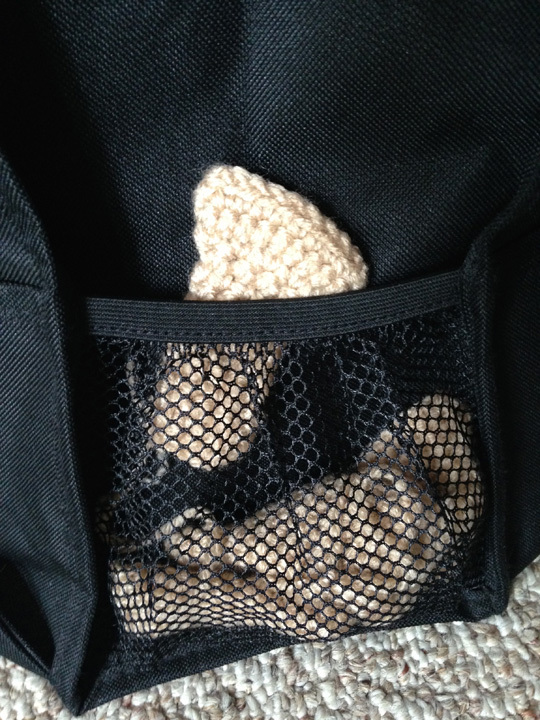 Plus, my family was really getting creeped out seeing all those disembodied body parts floating around in my bag. Personally, I didn’t see the problem but I decided to try to finally make a home for all those parts. 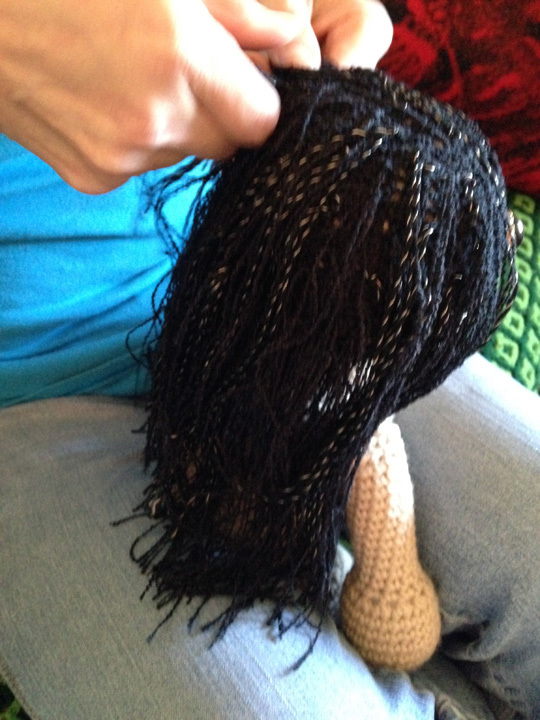 Once Mini Me was done, I finished the body attached to the other side of the skein. Turns out the body was thinner than I thought the head needed AND it was a different kind of yarn than I’d used tor the head (so the shade was slightly off). Wwwwellllll, I wasn’t about to make a new head for the new body – that would mean the “floating” head I had would still be cast off in the bag again – so I attached it anyway. The head finally got her body. Those are her new legs next to her. Her ‘almost’ arms and legs are in the side bag at the bottom. I pulled out the extra limbs I had, two arms and two legs, and realized the yarn for those matched the head but not the body and they were too short and fat for the accidentally-too-skinny body. I couldn’t do it. I could not bring myself to attach them to the body. I was already thinking the body was too skinny for the head and I just couldn’t add insult to injury by attaching short, stubby arms and legs too…I couldn’t do that to her (she might already have a complex). Instead, I made brand new arms and legs that fit better. Meanwhile, Mini Me was getting jealous because she was being ignored. She was still bald and naked and waiting for her clothes while I was tinkering with her unplanned sister. I have to admit that Mini Me is my favorite but I have hope for my “Frankendoll.” So now I have two dolls that have to be wigged and clothed and they don’t even like each other. I hope the rivalry ends once they realize I have room in my bag for both of them. 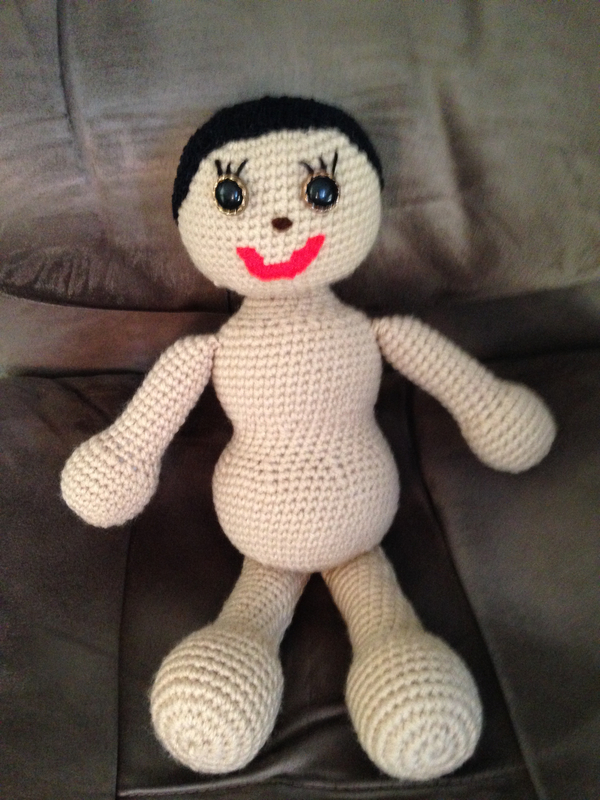 I hope I can come to love my surprise doll as much as I love Mini Me but only project completion will tell. Now they are both indecent! But at least they’re pretending to love each other. After all that, I still have disembodied body parts in my bag! 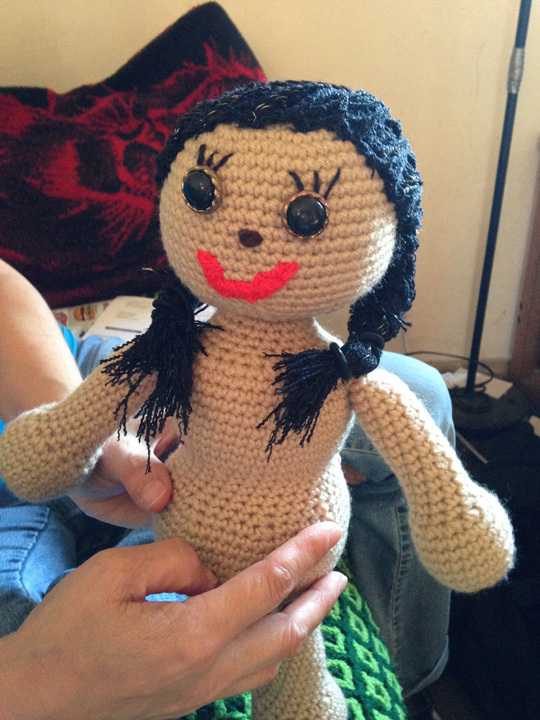 This is the progress on my look a like doll. I think the eyes worked out nicely. Now I’m planning the perfect outfit and accessories. Okay, we won’t be identical twins but fraternal twins definitely!